Shortcake has already decided that St. Francis will be her Confirmation patron when the time comes so he has already been adopted as one of our family patrons. 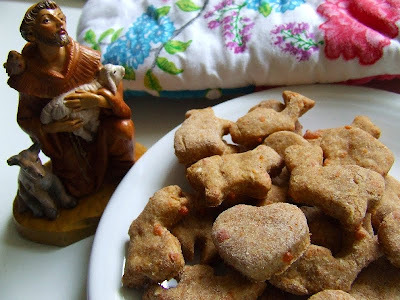 His feast day is today so we decided to make some animal treats (and some people treats). 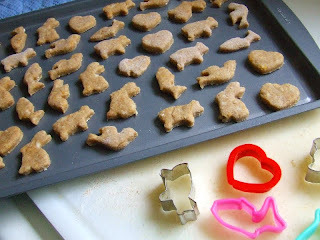 We thought it would be fun to use the set of animal cookie cutters (mine is similar to this set) to make some animal crackers for our furry friends. While we do not have one to call our own yet, we have some neighbors who will appreciate them! 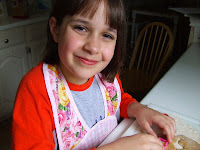 You can find the recipe for the Chicken Biscuits over at Catholic Cuisine. And if anyone out there has a sweet new kitty to spoil, we highly recommend the Tuna Tidbits. Miss Polly's cats give them 24 paws up! Word to the wise: the people treats smell considerably better while baking! 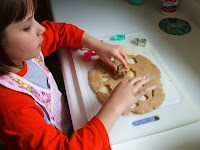 They are gorgeous cookies! You did a wonderful job. This is such a great idea Charlotte!